All season long, PFF will be ranking the best performing NFL rookies as they race for Rookie of the Year. With just two weeks left of the season, the race to be the highest graded rookie from the 2017 NFL season is heating up. Below is our weekly rookie rankings after the Week 15 games. PFF Elite Stat: White has allowed a catch just once per every 15.5 snaps he’s spent in coverage this season, the 11th-best rate among cornerbacks. White has found himself in a top-3 position within this race every single week since the start of the season, but up until now that No. 1 spot has eluded him. 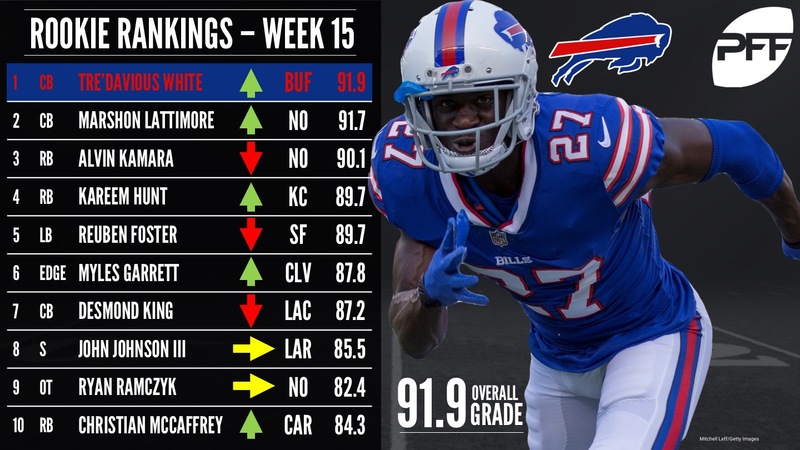 Well, pop the champagne in Western New York because here we sit in the middle of December and not only are the Bills still in the playoff mix, but their star rookie cornerback has finally taken the lead in the 17-week long race for PFF’s Rookie of the Year. White currently ranks third among all corners in terms of overall grade and he’s been one of the most consistent players all season, he’s finished just two games with a game grade below 70.0 while Week 15 was his seventh game of the year over 80.0. Opposing quarterbacks have just a 65.5 passer rating when targeting White in coverage and the first-round pick out of LSU has directly forced an incompletion (whether it be via pass breakup, interception, proximity in coverage) on 25 percent of the targets into his coverage, the eighth-best rate among 124 qualified cornerbacks. White has been outstanding all season long and with two more weeks to go he’s currently the front-runner – in a very, very tight race – for PFF’s Rookie of the Year honor. PFF Elite Stat: Opposing QBs have just a 37.5 passer rating when targeting Lattimore in coverage, only A.J. Bouye (29.5) has held QBs to a lower rating. Lattimore ranks just behind White as our fourth-highest graded cornerback this season and he’s one of just six corners who presently own an elite PFF grade (over 90.0). The former Ohio State star put up an 85.7 overall grade in Week 15 against Bryce Petty and the Jets – his seventh game this season with a grade of at least 80.0 – as he allowed just 3-of-7 targets to be caught and had both an interception and a pass breakup. Lattimore has allowed a first down or touchdown on just 24.0 percent of the targets into his coverage this season, the fifth-lowest rate among corners and significantly lower than the league average of 37.4 percent. This race is going to be extremely tight down the stretch, now that Lattimore is back and healthy, can he make a push over the last two weeks to jump White and re-claim the No. 1 spot he held for a good chunk of the season? PFF Elite Stat: Kamara leads all RBs with a 128.9 elusive rating this season. Kamara ranks second among running backs in terms of overall grade with two weeks to go in the regular season and he’s one of just two running backs (the other being Todd Gurley) to rank within the top-10 among backs in both run grade and receiving grade. He ranks third among all players – not just running backs – with an average of 2.69 yards per route run and he’s picked up a first down or touchdown on 45.6 percent of his targets this season, the third-best rate among the 17 running backs who’ve seen at least 50 targets this season. Kamara has posted a game grade below 70.0 just once since the start of Week 3 (69.8 in Week 8) and over that stretch he’s been north of 80.0 on six occasions. Can he hold off a late-season push from the guy right below him on this list and possibly take home Offensive Rookie of the Year honors? PFF Elite Stat: Hunt has had 17 rushes this season of at least 15 yards, the most among running backs. After a dominant performance in Week 15, Hunt is right back in the mix and very much alive in this race for PFF’s Rookie of the Year. The rookie out of Toledo has run hot-and-cold this season and if he can close out the season in a similar fashion to how he started, he very well could reclaim his spot right at the top of this list. Hunt has now finished each of his last two games with an overall grade of at least 70.0, including an elite 90.1 performance against the Chargers in a crucial game this past Saturday. For the season, he sits right behind Kamara as our third-highest graded running back. He leads all RBs with an 88.4 run grade and he’s forced an absurd 55 missed tackles this season, Le’Veon Bell is the only other back to have forced more than 40, and he’s carried the ball 65 more times than Hunt. PFF Elite Stat: Foster ranks fourth among all linebackers with a 12.5 run stop percentage. Foster currently ranks fifth among all linebackers in terms of overall grade and he joins Bobby Wagner, Luke Kuechly, Lavonte David, Sean Lee, Mychal Kendricks and Telvin Smith at the table of linebackers who currently own both run defense and coverage grades of at least 80.0. The rookie out of Alabama posted another game grade north of 80.0 in Week 15 (81.4), a threshold he’s now passed in all but two games as a pro. Foster has allowed just 26.9 percent of the targets into his coverage to result in either a first down or touchdown – the sixth-best rate among 63 linebackers who’ve spent at least 200 snaps in coverage – and he’s earned a positive grade on 20.7 percent of his snaps spent in run defense, which leads all linebackers. Foster has quickly shown that he is an elite three-down linebacker, what a steal for the 49ers at the back of the first round. PFF Elite Stat: Garrett leads all rookies with 32 total pressures since he made his debut in Week 5. Garrett is now up to 13th among edge defenders this season in terms of overall grade and he’s one of just eight edge defenders who own both a pass-rush and run defense grade of at least 85.0. He missed a good chunk of time to start the season, and he plays for the Browns, so I’ll forgive you if he’s flown a bit under your radar this season, but he’s been as good as advertised when on the field. He’s tallied at least three pressures in all but one game so far this season (he played 19 snaps in his Week 5 debut and only notched two sacks), including a five-pressure performance in Week 15. He’s finished just one game all season with a grade below 70.0 (Week 10 in Detroit) and he’s broken the 85.0 mark in three of the eight contests he’s been on the field for at least 30 snaps. PFF Elite Stat: King is tied for the lead among cornerbacks with 21 stops in coverage this season. King had arguably his worst game of the season against Kansas City in Week 15 (50.0 overall grade) and as a result he gets jumped by Garrett in this week’s update. One game, however, does not drastically take away from what King has accomplished as a rookie. He currently sits 11th among corners in terms of overall grade and he’s one of just nine cornerbacks this year to have both a coverage and run defense grade of at least 80.0. Something we’ve touched on here in the past is how productive King has been at covering the slot, and that still stands true with just two regular season games to go: King is one of just 12 cornerbacks to have spent at least 300 snaps covering the slot this season, among that group only he and Aaron Colvin are yet to surrender a touchdown. PFF Elite Stat: Johnson’s 8.4 run stop percentage when lined up within eight yards of the line of scrimmage ranks sixth among safeties. Johnson now ranks 11th among safeties in terms of overall grade and he’s one of just six safeties to have a coverage grade of at least 85.0 and a run defense grade of at least 80.0. Johnson started seeing regular playing time in Week 4 and he’s done nothing but reward the Rams with consistently good play, he’s finished just two games with a grade below 70.0 while posting a grade of at least 80.0 four times. Johnson’s been one of the best safeties in football when it comes to disrupting passes this season, his 23.5 forced incompletion rate ranks 14th among safeties. Johnson’s seven pass disruptions (breaking up a pass by either getting his hand on the ball or jarring it loose from a receiver with a hit) is the second-highest total among safeties. PFF Elite Stat: Ramczyk ranks 15th among tackles with a 96.5 pass blocking efficiency. Ramczyk ranks eighth among tackles in terms of overall grade and he’s one of just six tackles to have a grade over 80.0 in both pass protection and as a run blocker. The last pick of the first-round has now allowed one or fewer pressures in 10 games this season. Ramczyk has finished just three games all season with a grade below 70.0 and his consistent play opposite of Terron Armstead is a big reason why Drew Brees has been pressured on just 22.8 percent of his dropbacks this year, the lowest rate among quarterbacks. PFF Elite Stat: McCaffrey is one of 17 RBs to have at least 50 passes thrown his way this season, among that group he ranks first with a 1.35 drop rate. McCaffrey has been floating right around the 8-12 range for the last few weeks now and his big game against the Packers in Week 15 (86.3 overall) pushes him back in the top-10. The former Stanford standout ranks 10th among running backs in terms of overall grade and his 92.2 receiving grade ranks second. McCaffrey has finished every game of his career so far with a receiving grade of at least 70.0 and he’s picked up either a first down or touchdown on 45.2 percent of his targets this season, the fourth-best rate among running backs with at least 50 targets. He’s improved as a rusher as the season has progressed as from Weeks 1-8, he didn’t have a single game where he posted a run grade of at least 70.0, and now he’s reached that mark in 5-of-6 games since.